After Lennie Ashland graduated from Harvard, he faced grave personal loss that caused him to question his worth, and fear the future. 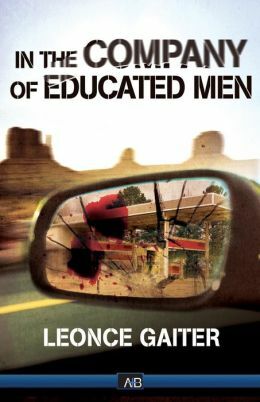 Armed with the arrogance and drive of Harvard-educated wealth, coupled with a young man’s aimlessness, Lennie planned a trip for himself and his two best friends to discover America—to view first-hand the re-ascendant grandeur of the American common man, a creature as foreign to them as any. The trip started off as most do—by not meeting the hype of its imagined romance—until the three happened upon an unlikely pair: a gun-toting teenager and a refugee little girl escaping from domestic hell. As gangland forces and family disputes descend on them, the five find safety and solace in one another. Together, they will both witness and embody the hope, grandeur, violence, innocence and hopelessness. Thank you to Astor + Blue Editions for sending us a copy of In the Company of Educated Men for our review. The quote above is a brief snapshot of the book’s description. I’ll admit to struggling with how best to write my thoughts here, owing to my overall feelings for the book are not overwhelmingly positive. I hate when that happens and I struggle with how best to write that, but in a positive manner. Positive, as the beginning of ITCOEM was going quite well. I was reading at a quick clip, Lennie and his two best friends from Harvard had just graduated and we were learning of their disillusionment with what came next. Lennie is the one that is the most well-off and an Ivy League education was nothing out of the common for him to obtain. Louise and Paul however didn’t quite have that silver spoon in their mouths and following their graduation had to fight to maintain the lifestyle expected of Harvard graduates. Here, I was enjoying the voice of Lennie quite a bit – the details of his disillusionment and desire to just break loose from expectation and get out there and explore America – were all very well done. I was gobbling it all up. The antics he deployed to entice Louise and Paul to come along with him were humorous and heartfelt. And then….we come to the meat of the story, or the parts where most of the action begin to take place, the part where their road trip goes to pot. Here is where it spiralled into a tale that became ridiculous (for me) and veered far off the rails into incredibility. A few years ago, I read The Borrower by Rebecca Makkai, and it was when I reached the middle of this story where I began to have many flashback moments to The Borrower. Again, here was a tale with a very strong start, one where I was shouting from the rooftops to “read this book!”, to one where I was, oh no, this cannot possibly be happening, this is moving so far away from the realm of believability, that I couldn’t wait for the end to happen so I could finally end my time with the story. Unfortunately, this is how I felt with ITCOEM, it held many plot similarities . 🙁 The situations that played out for Lennie and everyone that became involved in this road trip gone bad were too incredible to maintain my interest. The ending did redeem itself in some ways, and had me reflecting a little more on my overall feelings for this story, but there remained some unbelievable parts there as well. Unfortunately, In the Company of Educated Men did not hold on to its promise I felt it held in the beginning. In the end, and after reflecting, I felt the story overall was unpolished and underdeveloped.